Written by Kate White on October 15, 2018 . Have you ever found yourself wondering if that event exists? You know, the one you asked your engineers to send into Customer.io last week? Ever longed for a list of your customer’s attributes to help inform your email content? Maybe you’ve struggled to find a campaign by name, but you know the event that triggers it? Great news! The new Data Index page will solve all of these problems for you, in addition to others. 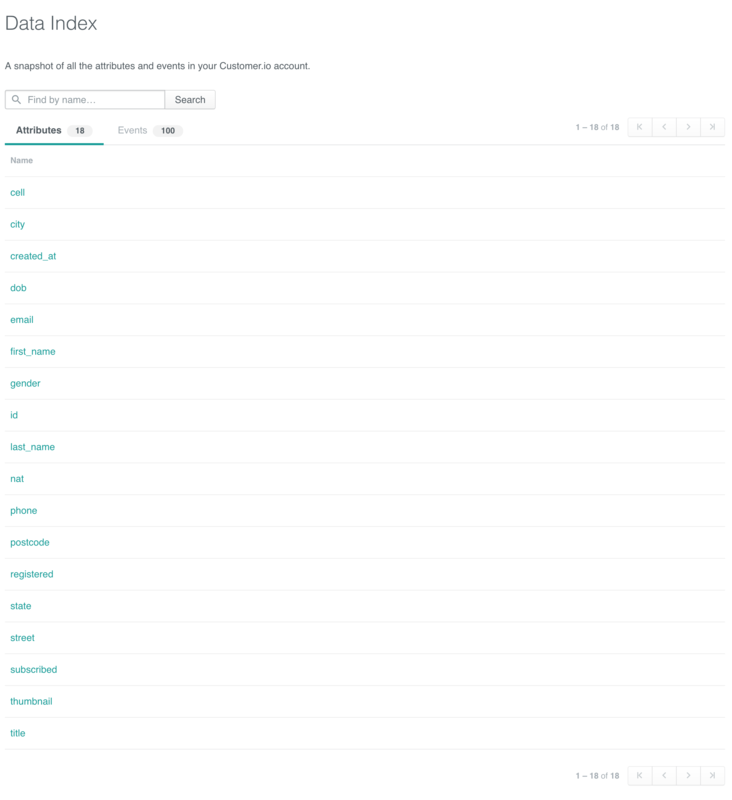 The Data Index page is a new way to view a complete list of events and attributes that exist in your Customer.io workspace. Read on and get to know this new feature and its benefits! With the Data Index, you can get a full picture of all the data available in your workspace. This is a great way to locate typos, understand your team’s naming conventions, and get an idea of all the events and attributes available for personalizing messages. Do you have hundreds of events and attributes in your workspace? No worries! A simple search will narrow down the lists to get you closer to what you’re looking for. If you’d like to see everywhere the event or attribute is used, click its name in the main list. 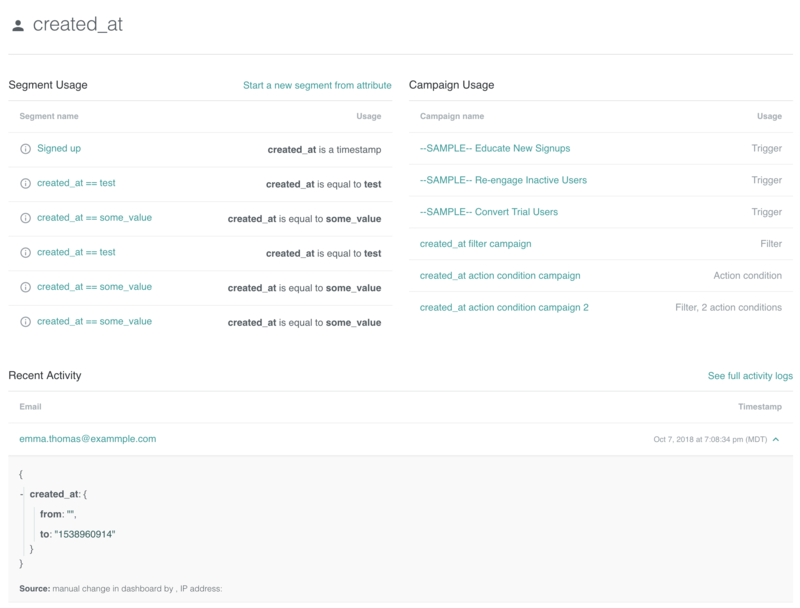 The detail view will list the campaigns and segments the data is used for and exactly how. This feature is not just an informational, view-only reference. You can create a new segment or campaign directly from the attribute or event’s detail page! Consider some of the other things this page can do for you: * Ready to propose some data clean-up to your team? Direct them to the Data Index to call out some of the naming inconsistencies or unused data. * Wondering why your event-triggered campaign has quit sending emails in the past few days? Go to the Data Index to determine if the event has been received recently or if it was renamed without the marketing team knowing. * Want to find all campaigns and segments that trigger when a user signs up for your application? Locate your signup event in the Data Index. * Curious about what data is available to you for a specific event and how it is formatted? Go to the Data Index page to view sample data from the event’s last occurrence. Help us improve the Data Index feature! Here are a few questions you can help us answer: * What else would you like to do here that you can’t just yet? * Was it easy for you to find what you were looking for? * Is anything confusing or unclear when using this feature? Any information you needed but couldn’t find? More detailed documentation can be found here, and as always, we’re here to listen if you’ve got questions or need a hand at win@customer.io!